Witness voting is an unpopular and boring thing, it seems. What most of the do, I have no idea. But what their server do, you can see in the blockchain. Every 3 seconds a new block is build. This is calculated by a complex semi random algorithm or magic. Anyway, it is for a normal person hard to guess, it seems random, but one thing is sure, every minute any Top 20 gets to make one. Make a guess and send 0.002 SBD to @gtw with your guessed witness in memo. 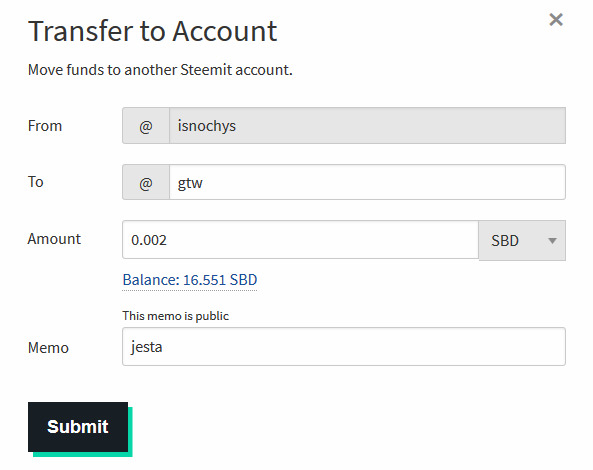 If you are right and the block, that includes your transfer was build by the mentioned witness, you win 0.021 SBD! Don't send anything but '0.002 SBD'. No refunds for STEEM or obscure amounts of SBD! First, you need a full node. Then you need to get the witness table for the next minute. get your ntp up to date. Everything needs to be synced! guess any of the top 20, those will show up every minute. Now you know the exact time your guess will make a block. 3 seconds before this witness makes it, you node has to execute the transfer. You built a $1000 System to drain the @gtw account of some SBD. Minnows are not interested in Witness voting. Most of them don't even know, what that is. At least this game helps a bit, to get their attention. Did you know, you can vote for me as witness and get a passive income doing so. Greetings @isnochys, I had come across some spam that your bot had upvoted. Would you please be so kind as to review? I was told you do maintain a blacklist and think such would be appropriate in this case. I tried to get in touch with you on Discord to no avail so figured I'd try here. So ganz verstehe ich das Spiel noch nicht, weswegen ich jetzt wahrscheinlich weiter oben geschriebenes wiederhole. Man schickt dem Account ein paar SBD-Cent ;) und trägt einen Namen ein und wenn zufällig der Node dieses Witnesses den nächsten Block erzeugt, hat man gewonnen und bekommt sein Geld zurück? According to paulag (I've omitted @ here not to point her here ;o)) people with less than 500 SP are redfish, not minnows. I don't think most of them care not about witnesses. This post has been upvoted by @minibot with 14.8%! You got a 50.00% upvote from @steembloggers courtesy of @isnochys! You got 14.63% upvote | Courtesy of @isnochys! This post has been upvoted by @microbot with 13.6%! You got a 15.15% upvote from @flymehigh courtesy of @isnochys! I upvoted your contribution because to my mind your post is at least 12 SBD worth and should receive 47 votes. It's now up to the lovely Steemit community to make this come true. Isn't that nice.. That's a first! And yet you only vote for Top 20 Witnesses..this is weird ..
Because they entered my blog post even though only once they entered ..
this doesn't make sense, but good luck with it! You have been defended with a 21.74% upvote! I was summoned by @isnochys. @isnochys, ist das Programm eigentlich noch online?